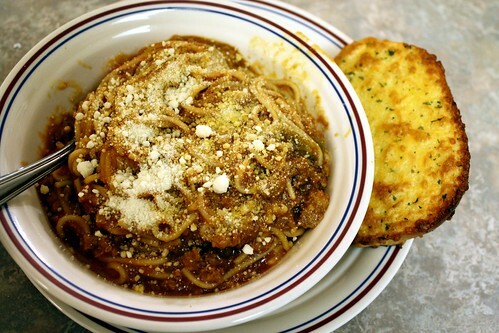 I must admit, this is one of the best recipes for spaghetti that I have had. It is quick and easy and is ready when I get home from work. It is the best ever. Serve with some parmesan cheese sprinkled on top and some garlic bread. This is so good to come home to after a long day at work!! Brown ground beef well in skillet and place in slow cooker. Add all remaining ingredients except dry spaghetti and stir well. Cover and cook on Low for 6-8 hours. (High for 3 1/2 hours) Turn to High the last hour and stir in dry spaghetti. Posted on January 11, 2014 January 21, 2014 by cookingwithpizazzPosted in Beef, Crockpot, Main DishesTagged Beef, Food, Italian, Main Dish, Recipes, Slow Cooker.